Transition from sticky notes that easily lose their stickiness to digital sticky notes. This download is a Google Slide with 6 sticky notes to plan your Language Arts unit. 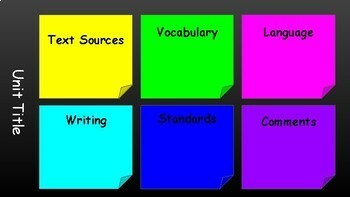 Easily editable, change sticky note topics and/or add your notes to plan your next unit. *I use this document for each unit on my curriculum map.